KGO transmitter looks like it's behind prison fences when seen from Dumbarton Bridge bike path. Image taken on my 2004 bicycle tour. I hear there is an "Occupy KGO." 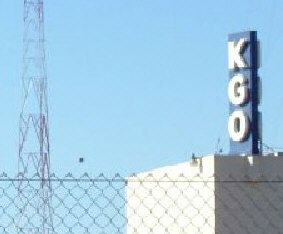 KGO Radio was a popular talk show station in San Francisco that I remember since the late 1960s. I grew up in Pullman, WA. but KGO's signal is heard up and down the west coast at night. Talk shows were booth liberal and conservative. Locally produced; rather than packaged off the network. Quite a forum for many years. Occupy KGO video I found (December 15 2011). Interesting. Just a few weeks ago, the new corporation, Cumulus Media, that bought KGO changed the format. Most of the talk show hosts were laid off. Maybe I should say they almost totally changed the format. Some of hosts have remained, but there's a lot more news and less discussion now. Constant news can be repetitive. People are mad, thus the Occupy KGO uprising. There seems to be an occupy everything, these days anyway. Rather than blowing my stack, I'm now using the internet. It's a relatively new source for talk radio. That's the great thing about the internet. So many choices and talk radio can still thrive. It's just thriving in new ways. NPR is one of many talk sources available on the net as well as on the air. Since KGO's recent changes, I've started listening to a wonderful forum on KQED. It's hosted by former KGO talk host, Michael Krasney. Krasney went off KGO years ago and is now on KQED, a listener supported public broadcast station in San Francisco. I've always appreciated Krasney's "nice guy" style. He's not a yeller. There are interesting guests and one can learn a lot. I listen on-line to Krasney's podcasts. They are archived, by subject. Easy to find the shows that interest me from months of well documented archives. NPR stations, and the national NPR network, do a good job with archives. Not just a list of show dates, but there are small blurbs on each show to accompany the download link. Who were the guests, what was the book about and so forth. Working as a custodian, I have lots of time to listen to the radio, but radio waves have trouble penetrating the building I work in. KQED's FM signal didn't make it to Bellingham anyway. That's where the podcast comes in handy. If I'm organized, I can download a bunch of interesting shows from different sources and take them with me. Learn things as I mop the floor. I hear that KQED is tops in the ratings for San Francisco Bay Area radio. Nice to know as it breaks that old adage "the nice guy finishes last." Krasney does have a "nice guy" sound. There's more to KQED than Krasney, but Krasney's Forum is the only show I've downloaded from so far on that station. Another talk station I've discovered is Wisconsin Public Radio. WHA, Madison is a flagship for something called the Ideas Network. Plenty of good stuff there. Commercial talk radio seems to be a dying art, but it has always had its drawbacks. Advertisements pay the bill. As greed gets worse, the time devoted to boring ads goes up while time devoted to interesting talk goes down. Ads were very repetitive. One gets tired of hearing the same ad over and over again. Couldn't they be creative and write more variety in copy? Listener support and even corporate underwriting seems to be a better model. Classic KING FM, in Seattle, has recently switched to the "listener support underwriting" model of funding. They used to be commercial. Back at KGO there's still some talk. Weekend host Karel is going strong; so far at least. One interesting tidbit, Karel is openly gay and he's one of the few hosts they kept. No I don't think the sky is falling for alternative views on the media. I'll still listen to KGO, occasionally, for Karel at least. Many of the other hosts will be missed. John Rothman with his knowledge of history, Gene Burns, with his formerly libertarian now more Democratic perspective, Bill Wattenburg with his fairly conservative, but uniquely scientific point of view. Maybe I will not miss Ray Taliaferro as much as he tended to be more of a yeller, but occasionally I'd listen and often agreed with what he said. His liberal perspective was on KGO since the 1970s. KGO's Cumulus management (Cumulus Corporation) has killed most of talk on that station, but many of these former hosts are, from what I gather, being courted by other stations. KSCO radio, in Santa Cruz, CA. seems interested and has already had Bill Wattenburg on. It's broadcast range is quite small compared to KGO, but KSCO is also on the Internet. Rothman, Taliaferro and Burns were recently (Dec. 19) on one of Karel's shows that's not on KGO. Karel is also syndicated on other stations as well as being on the web. On that show, Rothman pointed out that Cumulus didn't fire their hosts, they fired their audience! The internet is a game changer and my ears remain open.